They know you've saved their lives." Each one of these special dogs is deserving of a forever, happy home. We will gladly help you find your new best, furry friend! She will be happy to talk with you about our dogs! NOTE: Due to the loss of our long time boarding kennel, we currently are not accepting more dogs. However, our dog coordinator, Marilyn, is always happy to help answer your questions about rehoming your dog, or provide assistance in helping you adopt a dog. "There's so much tragedy in the world. But rescue dogs bring so much love and heal so many people." If you were watching this spot featuring sweet dog, Sasha, who was in need of a forever home, she is now in her new home. Here is Sasha with her adoring family! 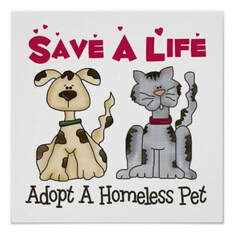 "For the Love of Animals Dog & Cat Rescue," flarescue.org, 626-524-1939. Call them directly or visit their website regarding information and their adoption policy.